300 Acres needing attention!Until the road gets reworked and upgraded, as well as some general maintenance to the upkeep of property the new price is at an unbelievable price of $350,000! Once work begins, asking price has to go back up! 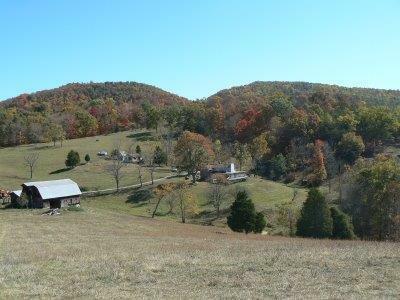 Laying close to the Virginia border this property has pastures and meadows, separated by woods, 3 ponds, 2 large barns, an older log cabin (pre-wormy chestnut), small 1 story home and several other sheds etc. It lays in a large open bowl, circled by far off mountains. Truly very private, yet only 2-3 miles to State Rt. 219. Yes, the driveway does need reworked, land needs to be mowed and livestock needs to be back on it, but the land, views, private location are superb!